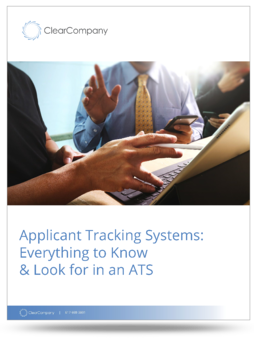 An applicant tracking system, called ATS for short, is used by employers to manage job applications. Applicant tracking systems enable recruiting teams to hire faster and stay organized while doing so. Many of today’s applicant tracking systems have evolved to include numerous features that help recruiters source candidates, post open reqs to job boards, filter through resumes, screen resumes, and even schedule interviews. What began as a resume parsing software 15 years ago has evolved into a variety of choices for strategic hiring and recruiting platforms. Explore these key ATS features more! In a basic sense, applicant tracking systems are mainly used to simplify the management of requisitions and candidates, but today’s ATS assist with far more. Web-based applicant tracking software can perfectly integrate within a pre-existing career site to provide a seamless candidate experience, while automatically collecting and organizing applicant information. Once the application is submitted, the ATS can also rank the resume and application based on required education, experience or skills. Aside from application submission and resume parsing, applicant tracking systems are also helpful in the next stages of the hiring process; screening and interviewing. Today’s evolved ATS have video interviewing capabilities and interview scheduling tools designed to help recruiters speed up their time-to-fill and provide candidates with a better experience. All of this data is stored into one database, allowing recruiters and hiring managers to easily collaborate. Robust applicant tracking systems will also integrate with background check providers for easy checks and authorizations, send offer letters and even predict an applicant’s potential performance at your company. While each applicant tracking system is designed to work in their own way, they all have the common goal of streamlining the hiring process. Learn more about how ClearCompany’s Applicant Tracking System works and its key features. Applicant tracking systems have come a long way in recent years, as new technology allows products and tools to evolve faster. According to Capterra, around 75% of recruiters and hiring professionals use a recruiting or applicant tracking software. In addition, the vast majority of those recruiters and hiring professionals (94%), say the applicant tracking software has improved their hiring process. There are many notable benefits to implementing an applicant tracking system into your recruitment process. Without the right system, it’s surprisingly easy to fall victim to an application process that gives your applicants a bad experience. Of applicants who have a bad experience, 42% state they would never apply for any other job opening at your company again, and 22% would convince their friends not to. Applicant tracking software benefit the process by providing automated responses. Many of today’s applicant tracking systems are also mobile friendly, giving your applicants the freedom to apply anywhere, anytime. 40% of candidates abandon the application process when it’s not mobile friendly? Automation takes many of the small, repetitive tasks and leaves the recruiter time to spend on more meaningful processes. For example, a small company with only 8 employees can save $10,000 in wasted time and effort using an ATS, according to RecruitingBlogs. How many applications do companies receive on average? On average, companies receive around 250 applications per job opening. If a company has just a handful of new openings, the wasted time and effort starts to add up. Read more on interview scheduling features in ATS. Using features like interview scheduling helps reduce time-to-fill, one of the most important metrics hiring teams consider in recruiting. Speeding up your time to hire is crucial in landing talent before competitors, and features that take the administrative work off your hands help reduce time in the hiring lifecycle. Consider the back and forth that often goes into scheduling interviews, then multiply that by the tens, hundreds, or even thousands of positions you must fill. It adds up! Interviews can be scheduled in the click of a button, on candidate’s own time. 20% of companies that implement an ATS report reducing their hiring time. Applicant tracking systems benefit recruitment planning by providing the analytics needed to make strategic decisions. ATS give hiring teams the ability to analyze large data sets from recruitment activities (sourcing, screening, interview scheduling, etc.) to understand where they are efficient vs. where they are experiencing costly or detrimental bottlenecks in their processes. Explore More Applicant Tracking System Benefits! We believe in a pricing model that works the way you do. We’ve been helping companies hire for 15 years and our transparent pricing options are built specifically for you – no hidden fees, software cost or tricky increases. Built with client feedback to be a lean, mean hiring machine, our Applicant Tracking System is ranked as the #1 system for small to medium-sized businesses! In the market to perfect one part of your talent management process? Only pay for the portions of the system that your team will use. Chat with us today to get a clear quote for Applicant Tracking! It can be intimidating to select a new software system for your company. Not only does it have to do everything you need it to do, but it also needs to be simple enough for your team to learn, a large enough value for your CFO to approve and implemented in enough time to be useful. It can be especially daunting when it comes to applicant tracking systems, for the simple reason that hiring the right talent makes your business successful. How well does it track and handle reqs? At its core, the ATS was built so requisitions could be entered, worked on and tracked. Despite the fact that Applicant Tracking Systems have evolved to include countless bells and whistles, you still need the system you select to align with how you work and not one that is counterproductive to your team. Make sure to ask specifically how you can configure the system to meet your needs. Is this pleasant and attractive for candidates? Ask the vendor for a company whose career page is supported by that ATS and go through the process. You’ll get a sense of ease of use, branding options and functionality in one fell swoop. During your demo, make sure to ask your representative or salesperson if their ATS has any tools or options to track candidate experience or how they measure or define it. Will this keep my team and our company data safe? Compliance keeps many recruiters and HR pros up at night, and with good reason! There’s a lot of sensitive data inside in many of the systems we use, and we’re frequently required to adhere to strict reporting policies. Ask how secure your data will be, and how frequently they’ve updated their safeguards and standards. If you work in a specific industry, ask for specifics about compliance and standards to mitigate risk. Does this work with my other stuff? Before you start evaluating ATS, list your tech stack, and send it to the representative conducting the demo so he or she can answer specific questions or offer case studies of other clients utilizing this integration. Also, check out partner pages or portals to find out what integrates with the ATS you’re considering as they may integrate with another solution you’re looking into. Look for who is behind the technology. Do they have good customer reviews and ratings? Are they responsive to complaints or comments online? Do they charge for implementation and assistance? Do they take customer feedback into top consideration when developing their product? You can gather reviews from all over the web and consider asking some colleagues in specialty groups on Facebook or LinkedIn. Finding the right applicant tracking software out of the hundreds on the market can be difficult. Take a look at some of the key features the best ATS have to serve as a baseline. What features should I look for in a best-in-class Applicant Tracking System? Expand on more applicant tracking system key features. In 2016, our research with HR.com unveiled that only 10% of recruiting professionals feel their applicant tracking software helps them hire better people. It’s with this knowledge that we at ClearCompany have continued to develop our product suite to help our thousands of clients find, hire and retain better talent. Our ATS was the very first tool we presented to the HR and recruiting space and though we have since developed an extensive talent management software suite, we never rest on our laurels. We have continued to add features to our award winning Applicant Tracking System so that our users can provide the best candidate experience and hiring process possible. See a full list of the awards ClearCompany software has earned, then click the button below to see a demo of the ClearCompany Applicant Tracking System. As one of the core pieces of a recruitment and hiring technology stack, your ATS needs to be a comprehensive solution. Check out these ClearCompany Applicant Tracking Systems Resources!